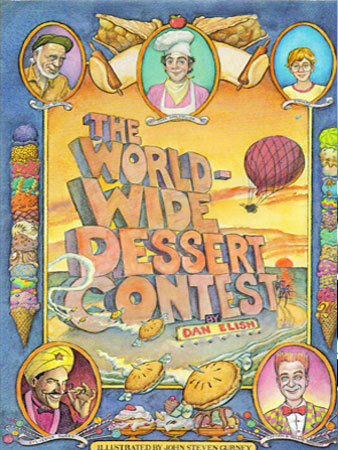 Aline Adams Media presents Dan Elish’s: The Worldwide Dessert Contest: Enhanced Multimedia Edition, an ebook with musical numbers embedded into the journey to play while you read. This multimedia fantasy novel about master dessert-concocter John Applefeller, his assistant Stanley and their friends. They learn together, with a bit of song, that with some ingenuity you can do anything you set out to do with a bit of mentoring and help from your creative friends. The music is incredibly earnest. The band of performers sing well, with clear and trained voices. The score is pleasing to the ear and can stand alone as a soundtrack to enjoy on its own. Depending on the preference of the listener, the low production values may not cause such a distraction as to deter from one’s listening enjoyment. The styles are reminiscent of the Andrews Sisters, traditional musical theater. Fans of the music from Carol King’s Really Rosie may fall in love with this singing ebook. A word to the wise: this ebook does not have any strong female characters. Applefeller, his band of friends and even the villains are men. The only potentially strong female character is Morocco and she is a donkey (albeit delightful) with a few other female secondary characters. Worldwide Dessert Contest is longer than the average picture book but too short to be considered a young adult novel. There are some pretty illustrations but they are used to punctuate excitement in the narrative rather than hold the attention of younger readers. This entry was posted in Listings and tagged 2011, 2012, Aline Adams Media, Andrews Sisters, Carol King, Dan Elish, John Applefeller, multimedia, Really Rosie, The Worldwide Dessert Contest: Enhanced Multimedia Edition by Kitty Drexel. Bookmark the permalink.